In an 18th century English village school all the students learnt the three R's by heart, but one among them was a bit queer and unusual. He was fond of drawing. It was not a part of the school curriculum. And what he used to draw were neither human figures nor those of animals, nor of flowers or fruits or trees nor of any other object of common observation. He loved to draw maps. As a little boy he was familiar with his native village and his first handiwork was therefore the map of that village. Nobody could imagine that one day that village mapmaker boy would grow up to become the first mapmaker of a vast empire which his countrymen were going to establish in a foreign land. Not only that, he was also to become the leading geographer of his time. Like a magnet he attracted many geographers of his day around him and used to have informal meetings regularly in his and his friends' houses. His inspiration and influence was so deep and abiding that his friends and followers formed the Royal Geographical Society within only two months after his death. It is interesting to note in this context that the admirers of Bacon took as long as 34 years after his death to establish the Royal Society ' the 'Solomon's House' of Bacon's New Atlantis. One of the earliest and most precious items in the archives of the Royal Geographical Society is that map of the village of Upcott near the market town of Chudleigh, in Devonshire, where this boy, James Rennell, was born on the 3rd of December, 1742. His father, John, was a captain in the artillery of the King's army, who died in action when his son was only four years old. With little formal schooling James Rennell secured an appointment in 1756 as midshipman in the Royal Navy at the young age of 14. For the next seven years he sailed the world, saw active service, and learnt his trade as a surveyor, mapping coasts and harbors even in the midst of battles. He was present at the attack on Cherbourg in 1758, and on his first ship, the Brilliant, he was party to the capture of two French privateers. His modest share of prize money was spent, characteristically, largely on the purchase of books. He saw no prospect of promotion in the Royal Navy and at the end of the Seven Years' War (1763) he went to Bengal. In course of this journey he surveyed the Bay of St Cast, the chain of sand banks that connect Ceylon to the Coromondel coast, as well as various harbor approaches. This enabled him, through the influence of one of his friends, Mr. Topham, who had been a midshipman with him on board the Brilliant, to receive a commission as Probationer Engineer in the army of the East India Company at Calcutta. In this capacity he was asked by Mr. Vansittart, the then Governor of Bengal, to make a survey of the Company's territorial possessions. He was not appointed Surveyor-General with the rank of captain in the Bengal Engineers till the first of January, 1767 when he was only 24 years old! All the foreign Companies which came to India were each a band of adventurer water-gypsies trading in foreign waters and their success depended largely on their knowledge of the coastal and inland waterways which in the beginning they had very little. They competed among themselves and had a great compulsion to overtake each other. The political situation in this country had also become very fluid. Aurangzeb, the last great Mughal, had died in 1707, the empire was tottering on its last leg, the provincial satraps had become virtually independent and had begun to quarrel among themselves. To make matters worse many pretenders had also joined the political fray. As the imperial sanads obtained by these foreign trading companies were not always honored by the local rulers, the companies also became eventually embroiled in these confusing fights. Their initial motive was to protect and promote their trading interests. They had as yet no territorial ambitions. So long they were plying in the hitherto uncharted coastal and inland waterways, now they were taking part in campaigns on land which was equally uncharted and unknown to them. After the Battle of Plassey in 1757 the English East India Company was first granted a zamindari by grateful Mir Jaffar and by 1765 the nominal Delhi emperor granted them the Dewani of the subah of Bengal. Events were moving in a manner which ultimately transformed these kingmakers into kings. And they knew almost nothing about their new acquisition. All these made it necessary for the East India Company to undertake a survey of their new possessions and led to the appointment of Rennell as their first Surveyor-General in 1767, before the departure of Lord Clive at the end of his second administration of Bengal. James Rennell was an expert in marine survey and hydrography, but now he was to conduct land survey and produce maps. How was he to go about it? Fortunately for him Abul Fazl's Ain-e-Akbari, had just been translated. Prepared in the reign of Akbar, it contained a thorough description of the empire and its administrative and revenue units known as subahs, sarkars, parganas, chaklas etc. But their boundaries were not precisely demarcated nor were other prominent geographical features, like rivers and mountains, graphically represented in a map or chart. Distances and areas were estimated roughly and not after accurate measurements according to scientific principles of map making. The art of mapmaking itself was not at a sufficiently developed state at that time. The mapmakers of those days were still finding it difficult to pinpoint the accurate and exact location of a place for want of both its latitude and longitude. 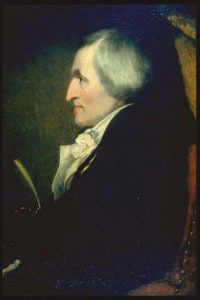 Rennell collected together the geographical data acquired by the British army columns on their campaigns and began to map all of India in 1765, subdividing the country according to the Mughal provinces (subahs), and six years after his retirement from the Company's service constructed the first approximately correct map of the subcontinent in 1783, though he called it the map of Hindoostan or the Mughal empire. Only a skeleton staff was placed at his disposal and the equipments were often very crude. The anarchical conditions and the primitive state of communications made their travels hazardous. The people were suspicious of the surveyors and often resisted them by force. Once he almost got killed by the so-called sannyasis. All these are amply attested by his Journal kept by him during his survey of the Ganges and the Brahmaputra. Rennell never fully recovered from the severe wound which he had received in 1766 in an encounter with the sannyasis. He had also contracted malaria from which he used to intermittently suffer. After the completion of the Bengal survey his failing health must have induced him to retire as Major from the Company's service in 1777, serving it only for 13 years, on a pension of 600 pounds a year. While in India he had married in 1772 Jane Thackeray, a great aunt of the novelist. The remaining 53 years of his life were spent in London and were devoted to geographical research chiefly among the materials in the East India House. His most important works include the Bengal Atlas (1779), the Memoir of a map of Hindostan (1783), the Geographical system of Herodotus (1800), the Comparative geography of West Asia (1831), and important studies on the geography of northern Africa ' in introductions to the Travels of Mungo Park and of Hornemann. He also contributed papers to Archaeologia on the site of Babylon, the island of St Paul's shipwreck, on the topography of the plain of Troy (1814), on Xenophon's retreat (1816) and the landing place of Caesar in Britain. He was also a pioneer in the scientific studies of winds and ocean currents. Before all things Rennell was a sailor. He returned to his hydrographic work whenever he found an opportunity to do so. Thus on his long return voyage from India in 1777 round the Cape of Good Hope, he mapped 'the banks and currents at Lagullas'. It was published as the Chart of the Bank and the Current of Cape Lagullas in 1778. His biographer, Markham, considers this 'the very first contribution to the science of oceanography' and rightly calls him 'the father of oceanography'. As the leading authority on the ocean he was offered the post of First Hydrographer to the British admiralty, but he refused it, as he was of the opinion that the duties of that position would interfere unduly with his research activities. In 1781 he was elected Fellow of the Royal Society and he received the Copley Medal of that Society in 1791. In 1825 he received the Gold Medal of the Royal Society of Literature. In a sense Rennell was not only the father of Indian geography but also one of the earliest Anglo-Indian historians of India. While others' histories were descriptive Rennell's was graphic, his language being maps and charts. He was a great admirer of George Washington, the first President of the United States of America, whom he inscribed a copy of his Memoir of a Map of Hindostan. His reputation as a distinguished geographer was not confined to his native country alone. He was made a fellow of the Royal Societies of both London and Edinburgh, member of the Royal Institute of France, member of the Imperial Academy at St Petersburg as well as member of the Royal Society of Gottingen. Rennell died on 29 March 1830 at the age of 87 and was buried in Westminster Abbey. It is indeed very curious to note that not only geographers but also men of letters have been influenced by the writings of Rennell. More than a century after Coleridge wrote his famous poem Kubla Khan, or the Vision of a Dream: A Fragment, a Harvard professor, John Livingston Lowes, wrote a book called The Road to Xanadu, pointing out possible sources for ideas, images, and phrases in The Ancient Mariner and Kubla Khan. From the entries in the poet's Notebooks he found that at the time of writing these poems Coleridge read a number of travel books, one of which was the History of Hindostan by Thomas Maurice. In its preliminary pages there is a mention of Major Rennell which was noted by Coleridge in his Notebook. Lowes argues: 'We know Coleridge's habit of verifying references, and the memorandum is conclusive evidence of his intentions in the present case." If Coleridge did read Rennell, he may have come across the following description of Kashmir, making it seem like a holy land, because of the romantic beauty of the fertile valley, encircled by steep mountains, with a river opening a path through it, and a garden in perpetual spring, with surprising fountains. 'The valley or country of Cashmere is celebrated throughout upper Asia for its romantic beauties, for the fertility of its soil. 'It is'.surrounded by steep mountains, that tower above the regions of snow; and'its soil is composed of the mud deposited by a capital river, which originally formed its waters into a lake'until it opened itself a passage through the mountains'. The author of the Ayin Acbaree dwells with rapture on the beauties of Cashmere'Only light showers fall there: these, however, are in abundance enough to feed some thousands of cascades, which are precipitated into the valley, from every part of the stupendous and romantic bulwark that encircles it. ' In a word, the whole scenery is beautifully picturesque; and a part of the romantic circle of mountains, makes up a portion of every landscape. The pardonable superstition of the sequestered inhabitants, has multiplied the places of worship of Mahadeo (whose image it was that appeared in the cave), of Bishen, and of Brama. All Cashmere is holy land; and miraculous fountains abound'. To sum up the account of Cashmere, in the words of (Abu Fazil), "It is a garden in perpetual spring." ' Rennell, 143-145. As described by Rennell, this group of pictures may have appealed to Coleridge, if he read the text, reinforcing similar descriptions of Kashmir in Maurice, and other writers' descriptions of the source of the Nile. According to Lowes not only the image of Kashmir as described by Rennell but also some words and phrases used by him recur in the description of Xanadu. If a geographer or mapmaker like Rennell could inspire a poet like Coleridge what has been his influence on the geographers themselves, specially of the country where he worked and the foundations of whose geography he laid? It does not seem to be much in evidence. In this country only one reprint of his Memoir is known to have been published so far. Not a single scrap of paper on Rennell could be found in the oldest university library. Even in his own life time the support he received from his employers was not much. The Company refused to bear the cost of publication of his Bengal Atlas. It was only through generous public subscriptions that its publication was eventually possible. How many, even among today's geographers themselves, have seen his maps and atlases? A large number of maps prepared by him are yet to be published. They were listed in a random manner by his biographer. A more systematically made list of these maps was published in 1917 by Major F.C.Hirst in the booklet The Surveys of Bengal by Major James Rennell 1764-1777. The Survey of India which Rennell was instrumental in setting up was to become a highly skilled organization. His successors accomplished the monumental task of surveying the whole of British India through the Great Trigonometrical Survey (GTS). Whether its high tradition has been maintained is doubtful. At least in one recent instance its action does not seem to have done it much credit. The State Land Records & Survey office in West Bengal made an attempt to prepare a report on the present conditions of the GTS pillars falling within a particular district. It was found that because of long neglect and non-maintenance their condition was deplorable, some were difficult to locate and identify and in one case a building had come up on the site of the pillar! Those who are associated with the work of survey and map-making know how important these GTS pillars are as reference points. Any deviation from its original location will inevitably make the later survey work very difficult and its result will be inaccurate. A large part of Rennell's work, available in the British Library, is yet to be published. Since Rennell's time great geographical changes have taken place in our country, for the proper understanding of which the study of Rennell's works is of paramount importance today. He is the greatest historian of our rivers. Those who are engaged in the over-ambitious project which plans to link major rivers of our country, must consult Rennell who surveyed our rivers more extensively than anybody else. THANK YOU FOR THIS INFORMATION .and i expect modern Indian geographers from you. Glad to know you liked the article dear GARAGU. Thanks dear AAR for your continued interest in Rennell' works. The regions Rennell demarcates in his maps are what he calls the "provinces" of Bengal -- revenue paying regions and units -- that would later be termed "districts." Some among these are zamindaris by themselves (Raujeshy [Rajshahi], Boosna [Bhusna] and Bettoriah [Bhaturia] are all separate zamindaris that were part, along with other regions, of the Rajshahi Zamindari or the Natore Raj, the largest zamindari in Bengal comprising 12,909 square miles (Rajshahi was the biggest in area, Burdwan had the highest revenue). Other areas on the map, such as Dacca, for instance were made up of several parganas held by large and small zamindars and talukdars. See Rennell's list in an appendix to the Bengal Atlas (online at Google Books). Rennell's maps actually date from 1766 when he conducted his survey. Thank you Mr. Vaikundam for your appreciation. As I do not know enough of the languages you mention I am unable to translate into any of them. However, you are welcome to translate the article in a language of your choice provided due credit is given to me for the original. a great english you can translate it into any other languages like tamil,hindi,marathi etc it reaches very well surely. Thank you AAR for the compliments as well as for the questions, which only you have asked in all these years since its posting here. The time of Rennell was actually a time of transition - the old administrative divisions were named mostly in Persian language which to me at least appear to be vague and without a knowledge of that language I am not in a position to tell their precise meanings. Before the coming of the British there were no maps and boundaries of adminitrative units were not precisely marked or probably not described in documents. You may get some help from three essays by Beames, Pargitar and Chakraborty reprinted by me in 'A Summary of the changes in the jurisdiction of districts in Bengal' which I published from the office of the State Editor, West Bengal District Gazetteers. There are works of Cunningham, Buchanan-Hamilton and Hunter's Statistical Account of Bengal which also can be consulted. Very interesting article — like the others you have posted. Rennell’s maps are now available on the Internet as you must have noticed. I am interested in his 1776 map of Bengal and Bihar (http://www.geographicus.com/P/AntiqueMap/BaharBengal-dury-1776) and was wondering if you would happen to know what the large regions whose borders he draws are. You mention the Sarkars, Perganas, Chaklas of Mughal Bengal. Rennell in his memoirs does not refer to them as such. Some of these regions have the same names as the later districts (e.g., Jessore) but some others don’t, e.g., Boosna (Bhusna) or Bettoriah (Bhaturia) or Attya (Atiya). Are these zamindaris and revenue districts of pre-British Bengal? Rennell in his memoirs refers to Raujeshy (Rajshahi) as a “province” of Bengal but obviously Bengal did not have regions that could be translated as “provinces” and Rennell seems to have used the description simply because he could not think of another suitable one. Would be very grateful if you would answer. Thanks in advance.